BAGHDAD, Iraq (CNN) -- As American soldiers now defer to Iraqi forces in their homeland, the six-year war has changed dramatically for the thousands of U.S. troops deployed to Iraq. U.S. soldiers secure a Tigris River bank Sunday before the handover of a military base near Mosul to Iraqi control. A security agreement that went into effect at the start of the year mandated the withdrawal of U.S. combat troops from Iraqi cities and towns by June 30. Almost a month after the completion of that pullout, the dynamics of patrolling the streets have changed dramatically. The Americans are no longer in charge, subject to the decisions and preferences of their Iraqi counterparts. U.S. Defense Secretary Robert Gates arrived Tuesday in Iraq to get a firsthand look at the new supporting role. And the top American commander in the region, Gen. David Petraeus, was in Baghdad last week to assess the security situation. Petraeus said an initial report shows the transition is going well. But violence remains a concern, and the continued presence of al Qaeda in Iraq and Iranian-backed militias poses a threat to the Iraqi government, he said. "Those are big adjustments," he said. "We have a lot of soldiers on the ground, and they are not doing what they were used to doing prior to the 30th of June." But part of the transition's challenge has been implementing the terms of the security document with its vague and convoluted language. "Well, I will be honest," said Lt. Nick Ramos, walking the streets in the dead of night alongside the Iraqi police. "Probably the biggest challenge so far is the several different interpretations of the security agreement. But the gap is closing. We're all coming together a little better, working together. It's taken a few weeks, it's still not perfect, but I think it will come together eventually." Before June 30, Ramos and his men might have entered at least five houses while on patrol. They might have interacted with the people, sipped tea with them. "Now we just interact with people who happen to be outside, but we don't go into houses, interrogate people," said Ramos of the 2nd Battalion, 5th Cavalry Regiment. The security agreement hands full control of the war to the Iraqis, largely restricting U.S. troop movement. American soldiers are now sitting on the sidelines of battle -- Ramos' combat battalion's new moniker is a "super-advisory unit." But the problems don't just stem from the logistics of implementing the agreement. American soldiers, used to being on the offensive, have had to adopt a complete change in mentality. "We like to think we always have the right answer, and sometimes I do, but here's the difference in terms of change of mind-set: This is their system that we're observing, that we're helping them validate," said Lt. Col. Flint Patterson, Ramos' battalion commander. "But at the end of the day, if they're happy with it and their systems are in place and sustainable, then that's what's important and I consider a home run." Varying interpretations of the security document have sometimes caused friction between U.S. and Iraqi soldiers and led to concerns about the safety of American troops. U.S. soldiers retain the right to protect themselves and clear the routes for their logistical convoys and troop movements, but the Iraqis must be notified at every step. Before heading out, Ramos and his company commander, Capt. Johnny Ulsamer, link up with the Iraqi National Police commander responsible for the area they want to patrol. It may have been unthinkable a couple years back, but the Americans now need Iraqi help and approval to run this mission. 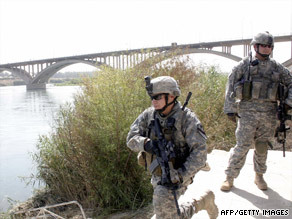 A few days before, mortars hit Joint Security Station Ur, a base that Americans use in northeastern Baghdad. Iraqi police Lt. Arkan Mouhsin tells the Americans he has an idea who may have been behind the attack, that insurgent elements are still intent on destroying stability. "We've passed them intel products they can work on," Ulsamer said. "It's a start for them hopefully to detain someone." At the suspected mortar launch point, the Americans want to make sure the Iraqis know to keep an eye on the area. Violence has erupted recently around a school. This is where the Americans say that pre-established relationships with the Iraqis have helped ease the transition. "It's a friend asking a friend to go on a mission," Ulsamer said. "It's not, you know, U.S. commander to Iraqi commander." The American soldiers said they've taken a leap of faith. They have not only transferred security responsibilities, but they've had to give their Iraqi counterparts an important resource: their trust. • A bicycle rigged with explosives detonated in an outdoor market in the New-Baghdad district Tuesday, killing at least seven people and wounding 13, an Iraqi official told CNN. The district has been the site of previous violence. On July 19, a bomb targeting a busy cafe wounded at least nine people. • Bank robbers broke into a safe, stole an undetermined amount of money and killed eight guards early Tuesday in central Baghdad, an Interior Ministry official said. The exact number of gunmen who attacked the state-owned Rafidain bank in the Karrada neighborhood is unknown, the official said. Two days earlier, gunmen attacked a money exchange center in Karrada, killing three guards and wounding five people, the Interior Ministry official said. The gunman failed to steal any money from the Nibal exchange.